(CNN) -- Four wickets from Dale Steyn capped an impressive bowling performance from South Africa and helped them take command of the third Test in Cape Town, as they bowled Australia out for 209 shortly before the close on day one. 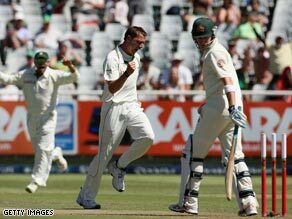 Dale Steyn celebrates the wicket of Mike Hussey as South Africa took early control of the third Test. Simon Katich and Brad Haddin were the only two batsmen to shine with 55 and 42 respectively, but the hosts struck at regular intervals to leave their visitors in a poor position after the first innings. In reply, South Africa had eased onto 57 without loss with Ashwell Prince (37) and Imraan Khan (15) still at the crease at stumps. Resuming after tea on 158 for five, Australia were dealt an immediate blow when Paul Harris trapped Haddin in front of the wicket and was given out lbw. Mitchell Johnson and Andrew McDonald then dug in, frustrating the hosts for more than 12 overs, before the latter walked across and feathered an outside edge off Makhaya Ntini to Jacques Kallis at first slip for 13. After that, the tourists completely fell away with Peter Siddle next to go two balls later when he too nicked behind off the same bowler, this time the catch snapped up at second slip by AB de Villiers for a duck. Steyn then tempted a stubborn Johnson to chase after a shorter delivery which was claimed by Prince running in from long-on for 35, before debutant Bryce McGain edged to De Villiers at third slip for two. It was a sorry end to the innings, especially after Australia captain Ricky Ponting had won his sixth-successive toss against the South Africans and opted to bat first.